Like the three editions that preceded it, this new edition targets markets in health care practice and educational settings. It addresses practicing nurses and nursing students, together with nursing leadership and nursing faculty. 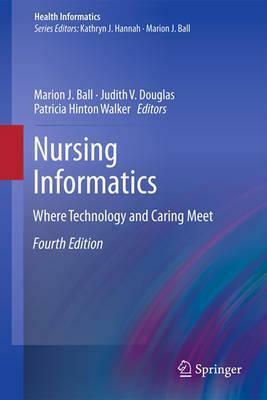 It speaks to nursing informatics specialists and-in a departure from earlier editions of this title-to all nurses, regardless of their specialty, extending its usefulness as a text as noted below. In recognition of the evolving electronic health information environment and of interdisciplinary health care teams, the book is designed to be of interest to members of other health care professions (quality officers, administrators, etc.) as well as health information technology professionals (in health care facilities and in industry). The book will include numerous relevant case studies to illustrate the theories and principles discussed, making it an ideal candidate for use within nursing curricula (both undergraduate and graduate), as well as continuing education and staff development programs. This book honors the format established by the first three editions by including a content array and questions to guide the reader. This 4th edition also includes numerous brief case studies that help to illustrate the theories and practices described within the various chapters. Most of these "mini-cases" are provided by members of professional nursing organizations that comprise the TIGER Initiative. These mini-cases are listed in the front matter and highlighted via formatting throughout the text. Illustrations note XXXII, 484 p.
Despite paying more for healthcare than any other country in the world, the US ranks below more than 40 other countries in life expectancy - down significantly from two decades earlier. As the Institute of Medicine concluded, "The current care systems cannot do the job. Trying harder will not work. Changing systems will." Creating a new system that is "safe, effective, patient-centered, timely, efficient, and equitable" demands transformative change and the health information technology (IT) to support it. For the more than 2.6 million nurses who make up more than half of the national healthcare workforce, IT will be more than an enabler. This fourth edition of Nursing Informatics serves as a definitive guide to the transformation now underway, drawing insight and energy from the initiative known as Technology Informatics Guiding Education Reform (TIGER). Launched by a small group of nurse advocates, TIGER is a guiding force for integration of technology and informatics into education and practice nationally and provides leadership across health professions and delivery settings. Subsequently, it has developed nine collaborative sections that address critical areas for change: education and faculty development, staff development, informatics competencies, standards and interoperability, usability and clinical application design, leadership development, national health information technology agenda, virtual demonstration center, and consumer and personal health record. This new edition reflects the core tenets set forth in the recommendations made by the TIGER initiative, focusing on a range of issues: -Transformation, culture change, and diffusion -Competencies, education, staff development, and leadership -Infrastructure, adoption, and implementation -Comparative effectiveness research and personalized medicine -Global initiatives The editors for this new edition include key nurse advocates and informaticians active in the TIGER initiative: Marion J. Ball, Judith V. Douglas, Patricia Hinton Walker, Donna DuLong, Brian Gugerty, Kathryn J. Hannah, Joan Kiel, Susan Newbold, Joyce Sensmeier, Diane Skiba, and Michelle Troseth. Kathryn J. Hannah, PhD, RN, is President of Hannah Educational & Consulting Services, Inc. and Professor, Department of Community Health Sciences, Faculty of Medicine, at the University of Calgary, both in Calgary, Alberta, Canada. Dr. Hannah is the Senior Editor of Springer's Health Informatics Series. Marion J. Ball, Ed.D, is Vice President of Clinical Informatics Strategies at Healthlink, Inc. and Professor at Johns Hopkins University School of Nursing, both in Baltimore, Maryland, USA. Dr. Ball is the Co-Editor of Springer's Health Informatics Series. Bonnie Wesorick, RN, MSN, is the Founder and CEO of the Clinical Practice Model Resource Center (CPMRC) in Grand Rapids, MI. Bonnie is the Chairperson of the CPMRC Associate Consortium. Her innovative work around CPMRC's mission to co-create and sustain the best places to practice and the best places to receive care has brought healthcare providers from around the world together.